I read the Elric Saga when I was a teenager. I am now re-reading them. I purchased an Omnibus called "Elric of Melinbone"
Anyway, I thought it contain all the saga's books under one cover, but I got half way through it and realized that some of the titles do not look familiar to me. Does anyone know the original order in which one is to read these books. I looked on Moorcock sites, but I am even more confused now. The Elric saga was the spark to the flame of my sword interest some 20 yrs ago. This is very interesting in that the original series that I read ,did not contain The Fortress of the Pearl or the Revenge of the Rose titles. Cool info. thanks, I may have to drag out my old copies and give a re-read as well. It could just be me, but I've always thought the song 'Black Blade' by Blue Oyster Cult was inspired by the Elric books. Hey thanks Anton, that is very helpful. I realize that the title change and the absence of the narrative collections in this Omnibus are what were throwing me off. Thanks again. If I'm not mistaken, that Moorcock worked with BOC on a project. So, that is probably it. Hello.I also read these books ,way-back-when.If I remember right,Elric was part of Micheal Moorcocks" Eternal Champion "series.There where several other heroes in this group,the only names that comes to mind though are Elric of Melnibone,and Count brass.There was one book, though, that had a Frazetta cover ,of a barbarian in a chariot, drawn by polar bears.I cant recall, the character`s name, but I do remember liking the story. Just my two penny`s. There was a crossover between Elric and the Count Brass series, but it's been so long since I read the Count brass series that I don't remember the details. Eric, I had a look at the liner notes of the CD with the song on it (Cultosaurus Erectus from 1980 if you're interested) and there's no mention of Mr. Moorcock. However, the liner notes are very limited so I'm going to keep looking. Hello.If i remember right all the" Eternal Champion "characters had swords that were detrimental to thier health,cursed,and not at all nice.But then none of Micheal MoorCocks characters were,nice guy`s, eather. I'm with Gordon. Corum was by far my favorite of the Eternal Champion incarnations. Of the Eternal Champion books, Elric and Corum were by far my faves, but I still enjoyed the Erekose and the Hawkmoon series. Mostly dark and depressing with no happy ending...very Irish. Maybe that's why I liked it! Moorcock hadn't written the Fortress of the Pearl or The Revenge of the Rose when I read through the original 6 books of the series. I still haven't read The Revenge of the Rose. I particularly liked how there were crossover stories in each of the series when the Champions met from the individual perspectives. BOC did a number of songs based on books by Moorcock. 'Black Blade' was one, as was 'Veteran of the Psychic Wars'. I'd cruise through my BOC CD collection to create a list, but it's all packed for my move to Wisconsin. Thank YOU for bringing this up. I'm going to re-read those books as well, and I bet this post has many others do the same. Thanks again Eric. 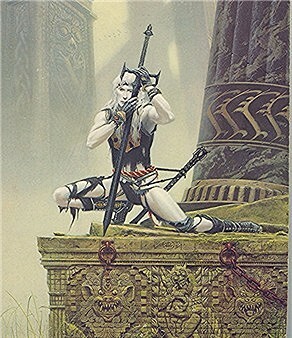 This is probably a silly question and has already been done but, has there ever been a fantasy sword made exactly like Elric's Strombringer with the claymore quillons, black blade and red runes? Raven Armoury does a Stormbringer, but to my knowledge, there is neither an exact copy of Whelan's version or Robert Gould's version of the sword. Moorcock himself wrote the lyrics to at least "Black Blade" and "Veteran of the Psychic Wars"; "The Great Sun Jester", too, IIRC. I didn't know that Veteran of the Psychic Wars was written by Moorcock, or Black Blade for that matter. And I had never associated Veteran... with the Moorcock books. It's cool learning about stuff like this. And The Great Sun Jester is my favourite song off of the Mirrors CD. Am I safe in assuming it ties in with the Eternal Champion theme as well?